 removing dew, frost or water. 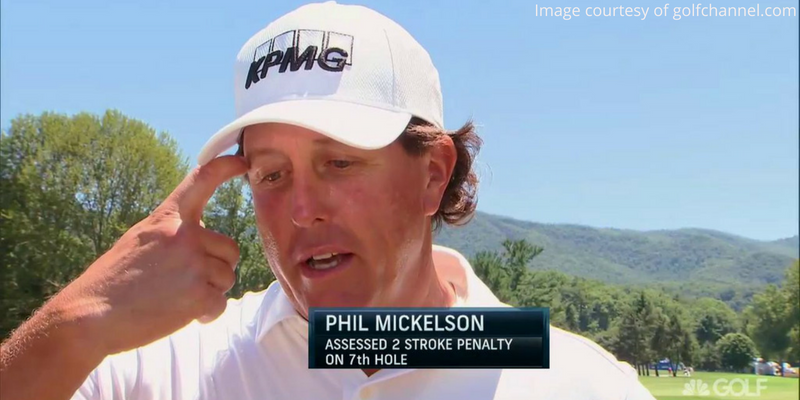 After Phil hit his tee shot he thought about what he did and did not think that he was in breach of the rules but wanted to ask a PGA Tour rules official just to be safe. After discussing what he did they assessed him a two stroke penalty for improving his line of play by pressing his club to the ground. This is a great example of how knowing your rules of golf this summer can shave a few strokes off of your score. Fescue is not something that you have to worry about in the winter but in the summer grass can grow up so when playing in tall grass remember rule 13 and be careful not to cost yourself two strokes. During the 3rd round of The Open Championship this past week Bryson Dechambeau hit his tee shot in one of the pot bunkers, and as he was getting a club from his bag he started to walk into the bunker and dropped his club in the sand. Most people would say this is a penalty for “grounding the club”, however it's not considered grounding your club if you accidentally drop it in a bunker or hazard. The term “grounding your club” is defined as touching the ground with your club to test the conditions within the hazard. However, if you are in a lateral hazard and there is tall grass you can touch the top of the grass as it is not the ground. This is why Bryson was not in violation of this rule when he accidentally dropped his club in the bunker. Joel Dahmen was paired with Sung Kang in the final round of the Quicken Loans National when Kang hit his tee shot into the lateral water hazard on the 10th hole. When Kang walked up to the lateral water hazard he proceeded to take a drop on the far side of the hazard thinking that his ball crossed and then came back. Rule 26 states that you may drop a ball outside of the lateral water hazard two club lengths from the point that it crossed the margin. 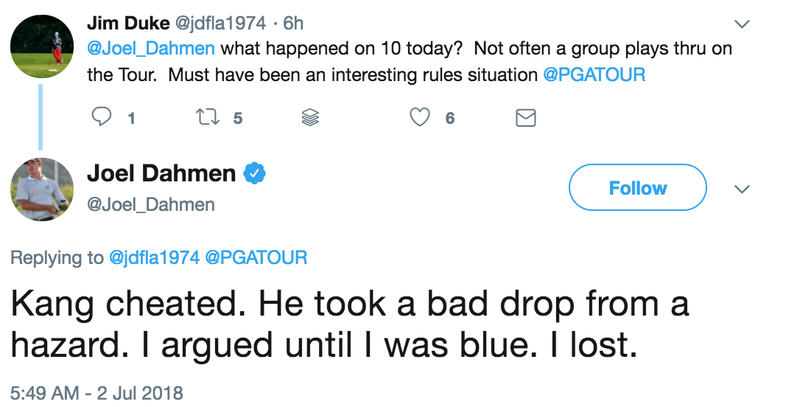 Joel Dahmen immediately spoke up saying that the ball did not cross the hazard and therefore Kang should drop on the near side of the hazard leaving a much longer shot in to the green. Kang argued with him for over 20 minutes and had to let the group behind them play through because of it. They eventually called a PGA Tour rules official over to settle the argument, and after hearing both sides of the issue he ruled with Kang. Now this may seem unfair but whenever there is a situation like this and no rules official is around to witness where the ball crossed, it's one man's word against another. Can you move OB stakes? This past week the third major championship of the year took place at Carnoustie Golf Links in Scotland. Many people gave it the nickname “Carnasty” because of its brutal conditions and a true test of the best golfers in the world. Hole 18 at Carnoustie is one of the few places on the golf course that has Out of Bounds, and it runs all the way up the left side of the hole. Many players ended up next to the makeshift fence area that marked OB, however there ball was still in play. If you were in that scenario your first instinct might be to just move those stakes that are in your way and play the ball as it lies. Well that would be a breach of the rules as it states in rule 24 that a player may move hazard stakes and other movable obstructions but something that marks Out of Bounds can not be moved. I hope you learned something about golf rules, and that you avoid making any of these mistakes while on the golf course this summer.